Lawdy Mama was produced by Ahmet Ertegun & Robert Stigwood. All the other selections were produced by Felix Pappardi. By arrangement with the Robert Stigwood Organisation, Ltd. The first time I listened to a Cream record was in the summer of 1971, and i was 15 years old. An older boy in my family had already a very big record collection, records imported to Norway from England. One day I played Live Cream volume 1 - and I was sold imminently - I recognised the musicianship between Eric, Jack and Ginger. Now, 37 years later - the feeling for this superb recording is the same as in 1971 - my body feel freezing when NSU starts up and Ginger taps his sharp drum followed by his two bass - drums, and Eric and Jack are entering the melody. One can only dream about to have been there at Winterland in march 1968 - and enjoy this concert, and when the 3 musicians were not to tired - yet ! Apart from some of the bootleg stuff (e.g. the 19 minute NSU at Brandeis University) the Live Cream version of Sweet Wine is the ultimate of the officially released tracks - all 3 band members interacting and taking their lead turn - wonderful stuff, real Cream. What a band Cream were live! They were a world apart, just listen to the improvisational chemistry between the band members. My girlfriend bought me this L.P for my 21st birthday present in '93. This album remains one my most treasured possessions and that's for the musical value! It is on par if not better than the live portion of 'Wheels Of Fire', thank you Donna! 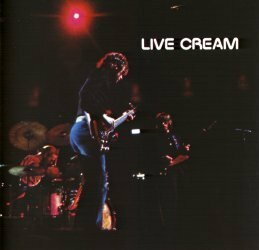 More than any other record, this album captures the interactive and improvisational strengths which made Cream such a powerful live band. The earlier studio versions of 'NSU' and 'Sweet Wine' are trivialised by the sonic barrage launched here. In 'NSU' the jamming at times approaches the swirling density of Indian raga, while in 'Sweet Wine' Eric plays some of his most fiery rock guitar. He also gets to strut some excellent straight blues-playing on 'Sleepy Time Time' and 'Rolling and Tumbling.' Although Eric's subsequent concert career would prove that he plays best when backed by a conventional rhythm section, its fascinating to hear him in this aggressive free-for-all band situation.